Religious beliefs and practices are surprisingly diverse in Israel. In a recently released video, one Pew Research Center expert said “the extent of the division is stark” even among Israeli Jews. Pew released the 19-minute video on October 13 as a companion to their study on the religious landscape of Israel published in March 2016. It featured numerous Israelis and Pew experts on religion, and dealt with weighty issues getting to the core of how the Jewish state defines its identity. While the vast majority of Israelis (81 percent) identify as Jewish, not all Jews embrace the same religious tenets, nor do they maintain the same lifestyles. Indeed, Israeli Jews affiliate with at least four dramatically different traditions and each maintain separate beliefs and practices. Individuals within each of these traditions – ranging from orthodox to secular – generally maintain little contact those outside their branch of Judaism. “The ones that are similar to you, those are the ones you marry, those are the ones you stay around, and those are the ones your kids go to school with,” the woman continued. Dona Weiss, anchor of Channel 2 News in Israel, expressed concern about how these divisions could influence Israeli society. “We’re going to have a problem of four tribes, no majority, no connections, no personal connections, no meeting points,” she said. Weiss, who said she identifies primarily with secular Judaism, said that the mandatory service in the Israeli army beginning at 18 years old historically helped to break down these barriers, but noted that approximately half of young people no longer serve due to various exemptions. She said the army could no longer serve as a “melting pot” because of this. 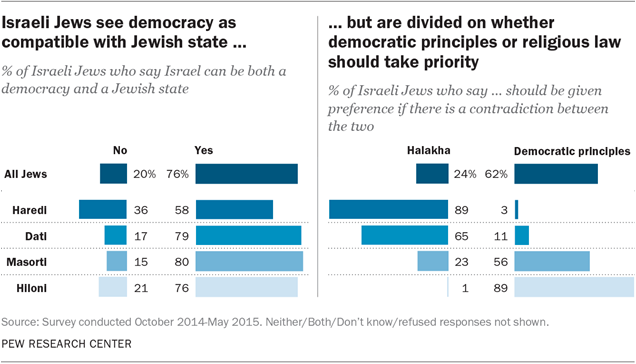 In addition to social rifts among Jews in Israel, Pew also found there are political divides. Those from various factions diverge on government policies regarding “marriage, divorce, religious conversion, military conscription, gender segregation and public transportation,” according to Pew’s study. While most Israeli Jews across religious divides agreed that Judaism and democracy are compatible, they disagreed about which values should take precedence if there was ever a “contradiction” between the two. Pew’s study showed that more orthodox Jews favored putting Judaism first, while more secular Jews favored putting democratic principles first. Some individuals interviewed for the video, specifically those coming from a more orthodox perspective, expressed concern about how principles like pluralism and tolerance could be taken too far, and undermine traditional values on issues like marriage. Others disagreed with putting faith ahead of democratic principles. Shibley Telhami of the Brookings Institution and the University of Maryland expressed concerned over how this could impact Israeli-Palestinian relations. “The turn to the right, the rise of ultra-nationalism, the expansion of religious groups, the focus more on Jewish identity, that has certainly created more tension over the past decade after a period that looked quite promising in the 1990s,” he said. Such divisions are not new for them. What is surprising is that manage to elect such effective leadership with such varied backgrounds. Why can’t we in the U.S. do that? Our recent leadership borrows trillions, pushes toward bankruptcy and moral bankruptcy, with no borders and downgraded military. Israel knows it cannot exist under such conditions. What makes so many Americans think we can?